On 31 May 2012, the Free State Initiative on Resistance, Surveillance and Treatment (FIRST) and the Southern African Treatment Resistance Network (SATuRN) group hosted an HIV drug resistance training workshop in collaboration with the Free State Department of Health Comprehensive Care Management and Treatment of HIV and AIDS Program (CCMT). The workshop was attended by 62 health care workers from clinics and hospitals within the Motheo and Xhariep districts of the Free State. The aim of the workshop was to provide an update on current guidelines regarding treatment failure and resistance testing, the identification and management of patients with treatment failure, and especially to highlight the factors which often contribute towards non-adherence and treatment failure. The team of presenters was comprised of specialist physicians, a psychiatrist, pathologist, and dietician, reflecting the multi-disciplinary approach which is needed to manage these patients effectively. Group discussions were held in which participants were asked to share the challenges and successes that they encounter in the antiretroviral treatment program. In the final session, information was provided regarding the scale-up of the European Commission funded FIRST project in the Free State and health care workers were invited to submit samples from patients with treatment failure for HIV resistance genotyping. 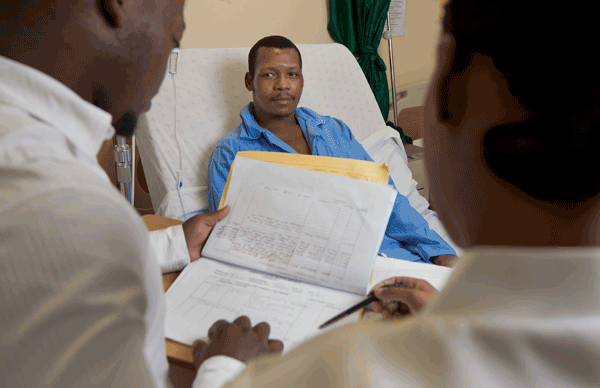 The feedback from participants was overwhelmingly positive and further training workshops are planned for the remaining four health care districts in the Free State province.